Depends what the sending off was for. 3 games is only for violent conduct I think. I'm guessing Naisbitt was dismissed for a professional foul (usually the case when a keeper goes)and that is just a 1 game ban. The HE states that Naisbett is only suspended for one game. I thought a straight red was a three game ban? Is the something to do with the timing of the sending off? He was sent off for a "professional foul" and that's a one game ban....................whatever time of season it is, there are no concessions on such matters and subsequently Mitchell Cole of Stevenage (who conned the ref into sending Lee Mansell off the other week) serves a 3 game ban for his sending off on Sunday ~ what goes round comes round eh Mitchell? Should they make the play-off final Mitchell Cole would play as his 3 match ban would be serverd in the Trophey Final V York City. Shame that....Providing we get there of course ! Well I am very confident, glad we are playing a village team. We will be at Wembley at the very least and I am plotting my away games for next year already (Darlington Morecombe etc). After the traumas of the past few seasons, (and the end of this one) the Gulls are going to give their stressed fans a break. Its going to be an absolute doddle and we will sail serenely into Division 2. I am drawing on 47 years of experience, I have an inner calm. Remember this post. If it goes horribly wrong mate your post will get hammered, not by me I admire your enthusiasm, I`m also used to pain, it comes with being a TUFC fan I`m affraid, when I say used to the pain well it`s more like I have begun to build up a resistance to the pain, it still hurts like f*ck but not as much as it used to! I just brace myself and hope for the best! Like it Sam! Maybe after our only win via the play offs coming from a tense penalty shoot out we are due to coast through this time. How about a 4-1 win on Friday, take the lead against Histon on Monday with them getting a late injury time goal (Sills o.g. determined to net at least 20 this season). At Wembley take a 3-0 lead against Stevenage in the first half followed by a hard fought 0-0 draw in the second half. It couldn't happen, could it? In respect of this match I wonder if Buckle will spring any selection surprises this time around? Green had a good game against Histon last time out. Maybe three centre halves will be deemed necessary to counter Histon's set pieces. Personally. I am torn in the Benyon / Strurrock selection dilemma but what a great problem to have! I trust Bucks to get it right on the night and expect a performance from all the players on a par with that pre Christmas game. He could be just the man to give a tiring Tim Sills a break during the final twenty minutes of a tough, thankless task against their uncompromising defence on Friday. It could well be a case of "cometh the hour, cometh the man" After all, the names "Christie" and "Torquay" are just aching to be coupled by some sub editors aren't they? I thought the same Al, on both counts. The ball tends to stick when it gets to Christie, no matter who is pushing/pulling him around, and he does have a considerable girth around which most defenders have no chance of reaching. Let's hope it doesn't end in extra time on monday followed by penalties making it an "Endless night". However, I'll lay my "Cards on the table" and pray that it doesn't all end as a "Three-act tragedy" or "Murder in the sun" if we are blessed with good weather on 17th May! I rather hope we are the away team at Wembley and then would be happy for any 'sub' to fall back on the easy option headline of "One-two, Buckle my shoe" based upon the final scoreline. Could that last one be a real sign or us to cling on to? I've warmed to this task a lot - particularly when we all know Buckle chose "Destination Unknown" as his preferred run-out track. At least I won't be late for work, eh? With Swine Fever now hitting the Torbay area I've heard rumours that all spectators attending Plainmoor on Friday will be issued with face masks. This will surely muffle any chants of 'Yellow Army' etc and so stop the large home crowd from giving Buckle's fearless warriors the vocal support they deserve ? Looking ahead to Monday will the Government want a few coachloads of potential carriers of the fever i.e Torbay locals travelling to Cambridgeshire & potentially spreading the flu to that part of Britain ? I think we now know the TRUE reason why Merse won't be going to Histon ! Unfortunately I won't be able to get down to the game tonight (but will be at Histon). 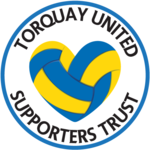 There are still a handful of seats left on the bus to Torquay! The coach has just been changed from a 49 seater to a 57 seater - so those wanting to go are still in with a chance for the lucky few remaining seats! ..
Would any other club going into play-offs ever be this poorly-supported? I wouldn't be surprised to see Mark Ellis play a part in both games (to protect our leads from the set-pieces which are their forté). Well, rarely has a day dragged as much as this one is doing. Counting down the minutes (seconds actually) until I can leave work at 4 (in Exeter), back up to Tivvy, then down to Plainmoor – hopefully to arrive sometime around 6.30. And then the tension will really set in! Hopefully we’ll attract at least a semi-decent attendance, though the prospects of that obviously aren’t helped by the (small) bus-load that Histon will bring along. Will any of the part-timers consider offering their support tonight as good use of their time? Do they understand that being there, might actually help us get to Wembley. Or will they stay at home with their feet up, and wait for the players to get us there before showing any interest? Do we have 5,000 people that want to assist in getting us to Wembley? Probably not. But we’ve got plenty more that’ll want to tag along for trip if we get there. As for the game itself, it’s almost impossible to know what to expect. Other than a spirited effort at containment from the opposition. I’d imagine they’ll park the team bus somewhere on the 6-yard line and not move too far from there. One up-front to control the punts up-field and offer a degree of respite will be the sum total of their ambition I imagine. And who can blame them. The only thing that might change their outlook is if they concede a couple of early goals. If that happens, they’ll have no option but to offer more, which can only help us. So do we have it in us to break them down? It’s not been a stong point for us at times this season. I’d imagine patience is the key – from the players and supporters. It might be a long night, and it might not be pretty at times. We might not get the early break-through which ‘opens the flood gates’. Histon are a good side. They are in the Play-Offs for a reason. So expecting a land-slide is unwise and ultimately unhelpful. Histons home form is very good, but our away form is equally impressive. The tie won’t be decided tonight whatever happens, so I’d hope we don’t get too cocky if we win, or too down-hearted if we don’t. Lets give it all we’ve got, and trust the players will do the same. We can’t ask for any more. Is it 4 o’clock yet…!? Alas, not. Just two more decisions to make – yellow shirt or white one? And pop side or away end? I can’t be expected to make choices of that magnitude on a day such as this! I’ll toss a coin. Fonda, 'yellow and pop'... it's a winning combination isn't it?! I can't concentrate at all on work, I hate having to watch on TV. At least when you're there you can shout or sing to try and make a difference... alas, I'll be punching the sofa, striking the air and hurling my raised voice into the ether with not one iota of influence on the game at hand. Give us a bit extra for me eh? I'll be doubly loud on Monday for those who can't make it. Epic battle tonight... but it's what we're all in it for right?